Sega Rally returns with 4 courses and more cars. The game still remains true the rally style of racing. Players must learn how to drift drive and make handbrake turns in order to get in the lead and more importantly keep it. Gameplay is again played in stages, where the player is against the clock as well as other CPU & Human controller drivers, and must complete a lap of each course - Desert, Mountains, Snowy and Rivera - within the time limit in order to advance to the next stage. Sega Rally returns with 4 courses and more cars. The game still remains true the rally style of racing. Players must learn how to drift drive and make handbrake turns in order to get in the lead and more importantly keep it. Gameplay is again played in stages, where the player is against the clock as well as other CPU & Human controller drivers, and must complete a lap of each course - Desert, Mountains, Snowy and Rivera - within the time limit in order to advance to the next stage. 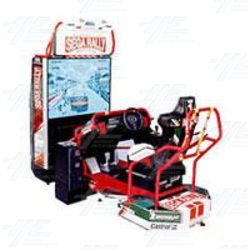 Sega Rally 3 is a driver, racing arcade game. This video was taken at the 2008 JAMMA trade show and shows footage of the the Sega Rally 3 from Sega.